Fatboy's Price Back In The Day. I'm sure I bought at least 3 Fatboys in the late 50s and early 60s. I had a penchant for losing them when on the road in motels or wherever. I often wondered, even then, how that razor could sell for $1.95. Was Gillette already embarked on the strategy that would become their hallmark sales philosophy for decades to come? Was there enough margin in the Gillette Blue Blade to swell the coffers of Gillette like later happened with the introduction of the carts? Or, was Gillette so able to predict what the future held in terms of market and margins that they were ploughing fields they knew would produce much future revenue? They sure didn't do that well with my father on selling the blades. Yes, he bought their blades, but he sure extracted a lot of mileage from each blade. I don't recall exactly how many shaves he got from a blade in those pre-Fatboy days, but you could get a rough idea of how far into the blade's use he was by how much toilet paper was scattered over his face when he appeared for breakfast. My mother just shook her head and served up the scrapple and fried eggs (we were from Philadelphia, don't you know). Whatever, it sure worked and the past is, indeed, prologue. Your dad sounds like me when I used to stretch those Mach 3 carts far beyond their useful life, lol. On another note, don't you wish you still had those Fatboys today? You could have a small fortune if you hoarded those $1.95 razors today! I started shaving in the late '70's and jumped in with the goo and cartridges my parents purchased. Somewhere there is a box of DE razors from my Granddad and Dad that my sister tucked away somewhere. I assume they are likely Slims and Fatboys but she can't find the box! I do remember my Dad shaving with a mug and DE but don't recall any multipass shaves but more a single pass and some touch ups. Then I got to play with the brush and soap left overs! beamon, the neat thing is, that if properly maintained, most of those Gillette Fatboys, Slims, and Super Adjustables work as well today as they did back in the day. I have to wonder what the current iteration of the Gillette Fusion will be thought of 50-60 years from now. (01-26-2016, 05:43 PM)Freddy Wrote: beamon, the neat thing is, that if properly maintained, most of those Gillette Fatboys, Slims, and Super Adjustables work as well today as they did back in the day. I have to wonder what the current iteration of the Gillette Fusion will be thought of 50-60 years from now. They will think it is crude - almost barbaric because we will all be shaving with lasers. 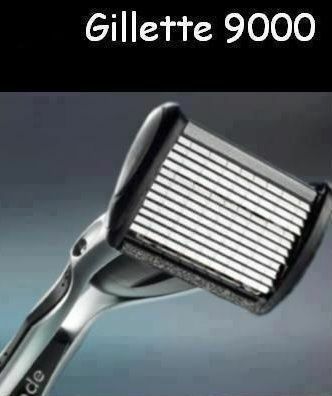 BTW - $1.95 in 1958 would be $16.24 today making them cheap compared to what a pristine razor goes for now. Thanks, I've been meaning to run that currency comparison. Still cheap compared to what? The Piccolo might be the closest current razor made much like the old Gillettes, chrome plate over brass. But that's not TTO adjustable so no direct comparison. It's over twice the $16.24 that you figured. Still would be quite a value. Re: the laser shaving. Could be, but it'll have to improve a whole lot over that, was it a Kickstarter project, laser razor that took a long, long time to merely cut off a few arm hairs. But everything has to start somewhere. Ment to say compared to what a red tip goes for now on the auction sites. If you think about how far cell phones have come in 30 years - I imagine the laser guys could someday have a product that works.